Thelma, together with her husband Dado and teenage sons Gerald and Yuri, are an urban poor family hired by a local foster care facility to provide temporary home and care to abandoned babies pending the latter's formal adoption. The inevitable separation is heart-rending for the foster family. Thelma's foster child John-John is to be turned over to his adoptive American parents. Every moment with the 3-year-old John-John becomes more precious as Thelma goes through the day fulfilling her motherly duties for the last time—bathing John-John, feeding him, and bringing him to school where the boy participates in a school presentation. 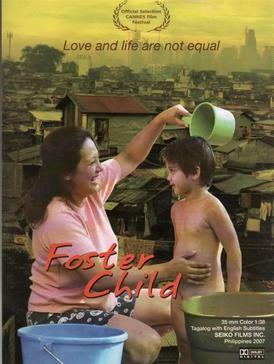 Foster Child, also known as John John, is a Filipino indie pregnancy drama film produced by Seiko Films, which stars Cherry Pie Picache as a temporary foster parent to an abandoned child. The film is directed by Brillante Mendoza. Foster Child is Brillante Mendoza's fourth feature film, following Manoro (2006). Mendoza is the fourth Filipino director whose work was screened in the Directors' Fortnight of the Cannes film fest.